What makes us different from other law firms? Before we prepare any documents, we spend time getting to know you, your concerns and your goals. During the first 30 minutes or so of an interview, a staff attorney spends time asking detailed questions about the family, the relationships with children, in-laws, grandchildren, or others. We ask about how the various family members handle money. We ask about the strength of the marriages. We ask about drug problems, disabilities, and sibling rivalries. These are issues that must be addressed if we are going to really help the clients. We must know about the family before we can address assets. The first thing we teach the clients is that estate planning has only a little to do with taxes. This is accomplished by informing clients of several critical reasons to plan. Nursing home costs concern many people. We can protect assets so they are not totally depleted on nursing home expenses, even if the person is already in a nursing home. We can also factor that planning into estate plans for elderly clients. We have a staff of professionals that includes two Medcaid review specialists who formerly worked for the State of Michigan in Medicaid review. As a member of the Michigan Forum of Estate Planning Attorneys, the WEALTHCOUNSEL National Study Group, and the National Academy of Elder Law Attorneys, we have about one thousand attorneys with whom to counsel, and who will help us stay on the cutting edge of estate review. Because our focus is on devising the best estate plan to fit the client's wishes and their lifestyle, at our initial interview we will spend time discussing how your family is structured. Our firm has prepared over 8,000 estate plans, most of which have been Living Trusts. Why a Revocable Living Trust rather than a Will? A Will is an instrument that can be used to appoint a guardian for minor children, a trustee and a personal representative to handle the estate of a deceased person. However, once a decedent has died, the Will still needs to be probated. The Will becomes a public record and the filing of the Will starts a lengthy, and sometimes costly (anywhere from 4-8% of the total estate), process of distributing the estate. A Revocable Living Trust can do all of the appointments that a will can do, but it also provides quick distribution of assets to beneficiaries, or asset protection for them (i.e., in the case of a child who may not handle money effectively, the trust will pay their bills and disburse money periodically). The trust remains private and never becomes a public record and there are no probate costs associated with the distribution of the assets. The Trust provides asset protection for the surviving spouse who may choose to remarry and can protect for dependents with special needs. How does a living trust work? When a trust is created for you it is not effective until you change the title of your assets to the name of the trust. Once the assets are transferred, you can serve as trustee and pay bills and spend money as you normally do. When you die, these assets do not have to be probated and the successor trustee takes over, distributing your assets according to your wishes. Your estate does not go through probate court (which is a public record) and therefore your affairs remain private. Remember, only assets that are in the name of the trust will be distributed according to the trust terms. You retain the right to revoke the trust and to appoint or remove trustees. What are some other benefits of a living trust? Under Michigan law, a spouse has a statutory (or legal) right to make a claim against their spouse's estate. A living trust avoids that statutory claim. This may become important in second marriages where the deceased spouse wants to protect his or her assets for the benefit of children from a prior marriage. Two things in life are certain: Death and Taxes. With proper estate planning, we can assist you with both so that the assets you have worked so hard to achieve are distributed according to your wishes, whether that is protecting a surviving spouse and family, or leaving money to charitable organizations for the benefit of assisting your community. Included in your estate plan should be a Power of Attorney we prepare Powers of Attorney as a general practice with every estate plan we prepare. A power of attorney, with proper HIPAA authorizations, allows someone (your attorney-in-fact) to take care of financial affairs should you become incapacitated. Without this document, no one can represent your interests unless and until the court appoints someone. In addition to a general Power of Attorney, we prepare Medical Powers of Attorney with HIPAA authorizations. Without these documents, if you are disabled no one has the authority to make medical decisions for you, including your spouse and children. The Health Insurance Portability and Accountability Act (HIPAA) was amended in 2003 to make all medical records private. Doctors, nurses and all medical personnel are forbidden by law to discuss any medical information about you without these HIPAA authorizations. Avoiding Probate all clients wish to avoid probate, but many are unsure why. If a client executes a will and then dies, the will needs to be probated. In addition to the costs of probate, the will and distribution of assets is a public record. That means on the day your children and loved ones receive assets, their names and addresses and amounts of distribution becomes a public record. A Revocable Living Trust avoids that. A trust can also provide protection for children who may have drug or alcohol problems, bad spending habits or troubled marriages. Advance planning can prepare your family for your death (expected or unexpected), but the key is to start your planning now. Michael E. Thomas is an attorney and life-long resident of Flint. He is married and has two children. He is a graduate of Kettering University (1971 Engineering), MSU College of Law (formerly Detroit College of Law) (1975 Juris Doctor) and Walsh College (1989 Master's in Taxation). He began his law practice in 1976. 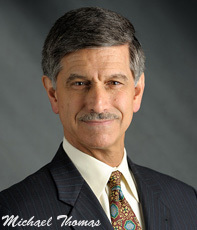 His practice emphasizes planning and elderlaw. He has completed more than 8,000 estate plans, and hundreds of Medicaid plans for nursing home residents. He has served, and continues to serve, on several boards of charitable institutions including the Baptist Children's Home and Family Ministries of Valparaiso, Indiana; the Michigan Association of Christian Schools; Michigan Association of Senior Health; and the Baptist Bible College of Clarks Summit, Pennsylvania. He served 20 years on the Deacon Board at South Baptist Church in Flint and teaches Adult Bible Class. He has served on the Strategic Planning, Student Improvement, and Health Curriculum Committees at Carman-Ainsworth Community Schools. He coached boys soccer for nine years and taught an after school bible study at Carman-Ainsworth Community Schools. He is a member of the Wealth Counsel Study Group, the National Academy of Elder Law Attorneys, Michigan Forum of Estate Planning Attorneys, the National Law Association, the State Bar of Michigan (including sections on Elderlaw, Taxation and Estate Planning), and the Christian Legal Society. He has devoted his legal practice to the integration of biblical principles with legal principles. Mr. Thomas is a frequent seminar speaker. Fran grew up in Flint, Michigan and earned her undergraduate degree from the University of Michigan-Flint. She is a graduate of Cooley Law School. She has worked with Michael Thomas in the area of estate planning since 1999. She is member of the State Bar of Michigan (Elder Law and Advocacy and Probate and Estate Planning sections) and the Genesee County Bar Association. In 2004 Fran was appointed to serve on the Standing Committee on Character and Fitness of the State Bar of Michigan, after having served as past chairman of District B, Character and Fitness, at the local level.